Myki has arrived in Melbourne. Kind of. The government announced yesterday it is now valid for travel on trains only, so if that’s the third of the PT system that you use, and you never get on a tram or bus, you can use it. I gave it a spin yesterday afternoon. Here’s what happened. In summary? The travel worked, but I was unable to put any more money onto the card, on two separate machines. Melbourne has had multi-modal ticketing for more than 25 years. The simplicity of it is the envy of cities that don’t have this. One ticket on tram, train and bus. But not with Myki. At least not yet. Of course, if you’re desperate to use it anyway, you can’t actually go and buy a Myki card and play with it today — unless you want a trip to a regional city first. You have to order online, and it’ll take about a week to show up. Once you have the card, you can travel by train on it. Because apparently it’s all working on the train system. All tickety-boo. And nothing to do with the impending self-imposed deadline of the end of the year that the government set themselves. So I tried it, with the kids trailing along with their Metcards, since they don’t yet have Mykis. I moseyed down to my local station with my Myki (bought in Geelong) in hand. I know from looking at the web site that the balance is getting a little low. Maybe I’ll put some more money on it. Bentleigh Station only has one Myki vending machine so far, on platform 3. That’s because the plum spots near the main entrance (platforms 1+2) are taken by Metcard machines. Later on they’ll take those out and put in Myki machines. So, I head for the machine on platform 3 to top-up my Myki card. Strike one! The machine is out of service. It has in fact been out of service for at least a week and a half now, despite me flagging it a week ago via a contact at the Transport Ticketing Authority. No matter. I have $4 something on the card. Enough for a trip. Over to the main platforms. Touch-on with the card. It works. Slowly — about 2 seconds, not the 1 second response time claimed. While waiting for the train I try the blue (Myki Check) machine, which can show me the card status and history. All looks okay. Train arrives. One stop to Patterson. Off the train. Touch-off. Again, about 2 seconds. It correctly charges me the discounted zone 2, 2-hour fare of $2.02. All good. The Patterson station Myki vending machine appears to be functioning. So I put the card on the reader and try to lighten my pocket by topping-up the card with some silver. The machine prompts me to insert the coins, but no. Not one coin will go in. I look closely at the slot. The lock thingy that prevents nefarious characters inserting unwanted objects is closed. It won’t take my coins. Strike two! I try again with another credit card. Same result. Strike three! Let’s read that quote again. I’m sorry Minister, but I beg to differ. If I have been unable to top-up my card at two separate locations (and remember, during the first stage of rollout, any station staff you might encounter have no ability to help with this), that means passengers at these two stations can’t pay for their train fares. This system is not ready, not even for trains. Sure, you can top-up online or via the call centre, (it’s 13 MYKI, in case anybody needs to know). When topping up your myki via the website or the myki call centre, please allow up to 24 hours for the funds to transfer to your myki. Up to 24 hours means the ability to top-up instantly while travelling is important. Now, I know some people will want to get a card and try it out (especially since they’re free for now). But it’s really hard to recommend it to anybody for regular travel who isn’t looking for trouble. Maybe the answer is to order one online, and tuck it away somewhere and keep using Metcards for now until Myki is fully functioning. The simple truth is the government has rushed this thing to the table while it’s still half-baked. After foolishly having promised it by the end of the year, they’ve switched only part of it on, but even that part doesn’t work properly. They should have waited until it works. Thursday update: I took another ride this morning. While the vending machine at Bentleigh still hasn’t been fixed (despite it making the front page of The Age yesterday), the money deposited via the web site on Tuesday night had shown up on my card correctly. At Glenhuntly, I successfully deposited a bunch of coins onto my card on one of the vending machines, and inspected my history. The other machine somehow couldn’t show me my history. I didn’t test the topup on it, but the coinslot wasn’t blocked like at Patterson on Tuesday. Touch-on and touch-off worked okay, except that one scanner at Glenhuntly didn’t work until the third try (it twice said “please try again”). The system appeared to charge me the correct $2.94 zone 1 adult 2-hour fare. Another trip this morning, this time Footscray to Bentleigh. Stopped off at Flinders St to see how the gates respond to the card. The answer is s..l..o..w..l..y… (at least on the first gate) but it did work. The hack job to get the Metcard gates to recognise Myki cards meant it flashed up a code which I don’t recall the exact wording for, but seemed to imply the Metcard barrier thought it was an employee pass. The second gate was faster. “Myki is here” posters have started going up (noted at North Melbourne and Bentleigh, with the latter having other posters describing how Myki works). But the posters about it still being in testing are still up at other locations (such as Footscray) — potentially confusing. The vending machine at Bentleigh has been fixed… almost. Topped up my card with cash. Tried with a credit card though… no go, it came back with an error saying it’s not taking cards. Daniel, the Transport department executives have as a performance indicator that MYKI will be operational by 2009. They have achieved this target and will receive their bonuses. Simple! 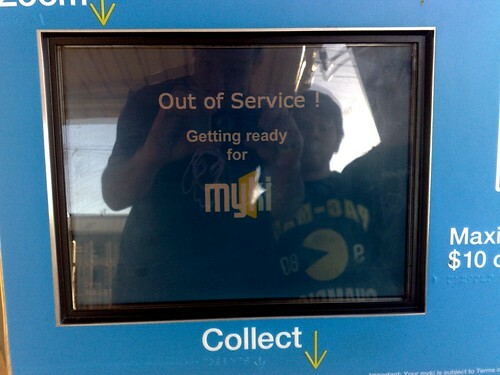 PS MYKI top-up machine at Brighton Beach station “Out of order” this morning. Very politely, I will say “Screw that!” and continue to buy metcards until I’m not allowed to anymore. I use the train system for two and a half hours every day. I want it working perfectly or not at all. Thanks for posting this example of how inept our transport minister is with just about everything she touches. I ordered a card for myself and tried to order another for my daughter, using my account but having her as the card holder. “Your details are already in the system, please call 136954”, it said. So what’s the point of having an account holder separate from the card holder? Is a five year old meant to have their own account? It should get us to establish an account and then add any number of cards to it, not order a card and then give it an account name. What a surprise that it’s all arse-about. Great, this is the government’s example of a system “Fit for use on the trains”. My god, Kosky stuffs up everything she looks at, What the hell was wrong with Metcard that prompted the introduction of this…. Oh wait… Oyster ? Oyster is an example of a system that works, not top up machines that does not accept money. I have not been down to my local station in a few weeks, but last i checked, out of 4 readers, 2 were broken (Some error), and one of them had a seal of approval from the local native wildlfe (Bird dropping scoring a direct hit on the card touch part of the reader). Melbourne’s new ticket standard CERTAINLY is the talk of the world, as a laugh and a joke around the dinner table. Ah. If you log in, you can do it, though it inspires little confidence with its sequence. And when I tried to add a card for a second child, it failed, saying my credit card was declined. Presumably the system has triggered an alarm at the bank due to too many transactions being carried out in a short period. The sign up process is incredibly confusing, I doubt someone who actually uses websites designed the thing. Fields are in a weird order (postcode before Suburb name?). If you accidentally put a space in any of the boxes it falls over. In the Street number field you can’t put a hyphen (for instance I live at Unit 8/6-10. I couldn’t put that, I had to resort to 8/6). Login has to be eight characters? How confusing is that? but password only has to be 6? It would be good of the three top up options had a little help icon you could click and get a pop up explaining them for those that aren’t as familar with the system as the rest of us PT nerds. Also, let people write their own security question. And, apparently it appears you can order one if you live interestate. I know of people in NSW who have ordered them already just in case they head down to Melbourne. Champing at the bit, I ordered a Myki Pass with 28 days, and $50 of myki money. Then I had a think about it and realised this may not have been a good idea. So that will sit on the shelf, and I will borrow the Myki ordered by my cat and just load some myki money on it to use until the trams and busses are up and running. Meanwhile you can log into the myki account tools but it looks like they won’t work til the card is sent out. There is one section called “My Requests”. It shows when you registered for Myki, which has a status of “Finished”. But it also shows one which says “Buy Myki” and has a status of “Waiting Patron Call”. Not sure what that means! Do I have to call them? and if so, why? My Seniors card purchased on day 1 from the happy little mykimite, cost $5 and contained $3 worth of travel. AFTER this introductory period, a second card cost $10 with $3 of travel included. I sent cards to 3 Melbourne friends so they could be ready for their big day and am annoyed that the 2 who tram around the CBD still cannot use theirs. Ballarat bus experience was that it breaks down a lot and many free trips were had. Scene: boy on bus karate kicks the myki reader. Driver says: Do that again and you’re off the bus. Boy repeated kick to reader. The $850 million cost reported yesterday, is nowhere near the final freakout. I ordered one because it was free but I have no intention on using it for a while. It might be worth getting one now before they cost $10 if you think you might need one in the future. My station (Laburnum) still has no Myki machines other than scanners on either platform, and I don’t do my travel exclusively on one mode so it’s not a lot of use to me. Just tried setting up an account only to want to edit it at the final hurdle…click the edit button and it takes you back to the beginning, then onto the penultimate page where you need to fill in all the boxes again *sigh*. Unable to register for free Myki without credit card hmph. Rang to do it manually over the phone, system updating so rather slow but big thumbs up to customer service gal who was uber-helpful and knew her product. My biggest concern right now is that the myki machine at beaconsfield appears to have been urinated upon. I guess the lower machine and buttons makes it easier to reach. Gross. So, so gross. I’ll do the same as “Somebody” – I’ve ordered the five myki cards, for my family of five, but they’re going in the draw for six months. The process for ordering more than one is very confusing, so I’ve put some details http://tinyurl.com/mykigroup . But guess what? (at 10:25am) – it looks like the https port (443) of myki.com.au has gone cactus. Just as well I completed the procedure 15 minutes before hand. Oyster *does* work and works very well. Indeed, its Pasy-as-you-go feature could almost have been *made* for my pattern of London usage. *However* it too had teething problems and is only now getting validity on most main line suburban rail services. Even then, that’s a bit complex. 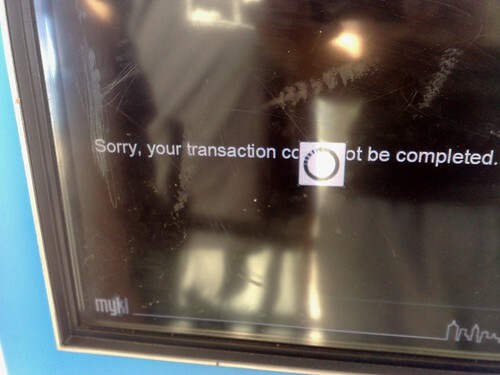 Myki seems to have more teething problems than Oyster but might well settle down, so I’d say don’t be too hard on it. At least your politicians aren’t as completely *clueless* about public transport usage as most of ours are! I tried ordering a card last night, but my session timed out. Tried again this morning, and my order seemed to go through. What I don’t understand is the need to register all that information. Last February I walked up to a news stand in Brisbane and bought a Translink Go-Card without giving any information. I did register the card online later on though, but it was optional. More importantly, the screen is TOO LOW. With LCD screens, they look best when you are looking straight at them. Look at them from a different angle (up, down, letf, right), and the screen is faded and unclear. SO NATURALLY they put the screen down at your crotch, so everyone except 7yr olds have to LOOK DOWN at the faded, unclear screen. Dan – thanks for this – very informative. Kennedy gave himself a deadline of 1969 to go to the Moon- which he achieved! Premier John Brumby and Transport Minister Lynne Kosky gave themselves a similar deadline- that MYKI would be online by the end of THIS decade! Well, it looks like they both succeeded! Well, sort of- Man landed successfully on the Moon in ’69 ( I’m sure the conspiracy theorists will disagree with me ), whereas we don’t even have myki up and running 100% yet! I suppose we have it on the trains though, where we still have to get a Metcard! Great! The irony- Kennedy wasn’t around to see the Moon Landing, and I’m sure Brumby and Kosky wish they weren’t around now! The other similarity- both projects probably cost the same too!! Kennedy and Kosky both had a year up their sleeve, decade ain’t over yet. Enno, you’re right- as there was no year zero ( the calendar went from 1BC, or BCE for the politically correct, straight to 1AD, or CE), so if you count in decades from 1AD, the new decades don’t begin until the ‘first’ year! Incidentally, if we go back exactly one decade, we were counting down the ‘Millenium’! Because of the above mentioned fact, the second ‘Millenium’ actually began on January 1, 2001, NOT January 1, 2000, as was generally accepted! Incidentally, the Fathers of Federation understood this- it was for this reason that Australia became a Federated Commonwealth on January 1, 1901, because they wanted Federation to officially begin at the start of the new century! I think when Myki gets older and more known it should replace metcards. What I like about myki is that you wont always throw your metcard away in the garbage and waste paper. OK, here we go with an attempt at an epic run of comment replies. @roger, Myki is not an acronym. There is no evidence of a DoT bonus, but the government have repeatedly said it would be running by the end of the year. @Brian, don’t blame Lynne Kosky. She inherited this mess and has to stand by it. The guy who approved it, former minister Peter Batchelor, is now Energy Minister (eg in charge of coal). @Philip, yeah if you order the first card, then login using your new account details, you can order extra cards on the same account. @Nathan, there is NO WAY I would use a Myki Pass right now. If you must test it, stick to Myki Money, so you know you can jump off it at any time back to Metcard if it turns out it’s so stuffed you can’t use it (or if you might need to use trams/buses at some stage). @Somebody, turns out there’s a bunch of stations that still have no machines, including some major ones such as Box Hill, South Yarra and Ringwood! @Jayne, you should be able to get a completely free card as long as you choose No Topup. @Ian, I’m coming around to the reality that Myki will eventually work, and will be quite convenient. (It damn well should be, at a cost of $1.3 billion.) But it doesn’t work now. It’s got so many flaws they should have just postponed the launch. @Ben, the online option is just the initial sales. Later on you’ll be able to buy them over-the-counter with no registration (as you can now in Geelong, Ballarat, Bendigo, Seymour, Gippsland). @Jagger, yes, agree. I know they wanted to make them usable for wheelchair users, but it seems illogical that they made every machine this low, instead of just one at each station. That said, I’m almost 6 feet tall, and I don’t find the screens too unreadable. @Andrew V, the government never said “End of the Decade” for Myki, they said end of this year. And as for kicking out Labor, that would sound a lot more plausible if the opposition were presenting any credible policy alternative. All they’ve said so far is Protective Services Officers on stations at night. (And on Tuesday on 3AW Terry Mulder pretty much said they were against generally re-staffing the system, eg tram conductors and fulltime station staff.) That gives us no real clues as to what they’d do if they got back into power. Totally being pedantic here, but the 00s actually stop today. Sure, the 21st century started Jan 1st, 2001, but the decade of the 2000s started Jan 1st, 2000. Back to the topic, I’m entertained that Kosky thinks the gumbies will start to use a “common sense” approach now when they still have quotas to worry about. Daniel- completely agree about the Libs, they should be all over this. Terry Mulder really impresses me, but i can’t say the same about Ted. Why not have a policy that all trams will be located in zone 1, thereby removing the requirement of having to touch off on a tram? I bet it would be a vote winner. Uhh no thanks. To get from Vermont South to Notting Hill I’d take the 75 tram, then the 703 bus. It would be a zone 1+2 fare. Better that they simply assume a single-zone travel, and accept the fact they may lose a bit of revenue (which they’ll claw back anyway for those who touch back on within the 2hr slot, if that’s in the other zone). None of the St Kilda Road routes, which supposedly make up half the system’s patronage touch Zone 2 so they might as well just set up the trams from those depots not to require touching off, and putting up notices to say so. Same goes for other routes too. Although if it just assumes you’ve gone to the end of the route (Zone 1 too) people will probably pick up on it and it’d become the unofficial norm. Gee, I wonder where the Hun got the idea for this from? The default fare on trams and buses isn’t that scary, its only a 1+2 2hr if the tram/bus actually crosses two zones… so there will be no adverse effects of not touching off on most trams. Happy New Year to you all! May you all have a happy and safe 2010! Make sure you get home safe tonight!! Agreed Daniel, Myki Pass wasn’t the best idea, but I simply won’t use it til I know the system is stable. But I wonder how many others dived in and bought one. I’ve seen at least one tweet from someone who bought a 6 month pass. That’s a lot of money to shell out on an unproven system! The code that flashes up on the Metcard barriers when you use a myki is ‘CSC’ which means ‘Contactless Smart Card’. Mathew, are you sure the default fare is 1+2 ONLY if the service goes to both zones? My reading of the manual is that it is 1+2 always (regardless of where it goes). Not that it’s really working yet, of course. I’ll get a free card, and see what happens. I’m mostly using trams these days, so no use going over quite yet. I truly don’t understand why Kosky et al thought it was more important to honour the “end of the year” promise than to deliver a system that worked properly. Consider how this would have played out if the Government had kept the lowest possible profile as the end of 2009 approached – no “Myki coming soon!” signs, no Myki Mates in coloured t-shirts, and so on. I believe the average commuter would simply have forgotten about the end-of-the-year promise. Let’s face it, no one who actually uses the system has been hanging out for the introduction of Myki, ticking off each Myki-less day that passes. There are heaps more important things to worry about, things that really do affect their daily commute. Anyone who did remember the Government’s promise would probably just roll their eyes and mutter something about another year gone by, yet another promise broken, what else is new? – and turn their attention to more important things, such as whether their train will be cancelled again today, and if so, whether they’ll be able to squeeze onto the next one. So Myki would pretty much drop off everyone’s radar, and then, when finally delivered – in 2010, 2011, or whenever – with due fanfare, and seen to be working properly, from Day One, we commuters might just be won over by it. Sure, we’d still have reason to grumble at its lateness of delivery, and the amount of money spent, but we’d be considerably mollified by the fact that it had been thoroughly tested and now worked well. Instead, Kosky et al have delivered, with much fanfare, a half-baked system, full of teething problems, solely because they wanted something – anything! – delivered by a certain date. They have thus ensured that their end-of-the-year promise *will* be remembered by the travelling public, but for all the wrong reasons. Years from now we will remember that this fiasco was caused by a Government that thought an arbitrary deadline was more important than system quality. Personally, I will continue to use my Yearly Metcard (purchased through the PTUA, of which I am a member – thanks, Daniel!) until it expires at the end of Nov 2010. I’m even thinking of buying a second Metcard now, to take me through until Nov 2011. Except I suspect that the existing validators will have been ripped out long before then, and that I’ll be forced to exchange my Metcard for a Myki card, whether I like it or not, and whether the Myki system is truly ready or not. Do you know if an existing MetCard is transferrable on to myki? That is, if I have an annual metcard expiring say at the end of the year, will I be able to transfer the remaining days on to a myki (which I will only do when it is working properly!). I’m due to get a new annual metcard through work and want to avoid having a paper ticket for a whole year if I can, but I’m not willing to load a year on to a myki at this stage. This message is in relation to your recent concession myki order. We have experienced a processing error and your myki has been sent to you with the wrong letter. The letter states the card is not registered. This is not correct, the card is registered. We tried to call you today to explain this so that you weren’t confused when you received your myki. Please be assured that your myki has been registered and all the benefits of balance protection are available to you. Should you have any questions about this please contact the myki call centre on 13 6954 (13 myki). – seems like they’re determined to stuff everything up. Thyre: Putting all trams in Z1 would mean a price rise for Z2-only trips, as Nick says. But putting them all in “any zone” (eg a huge Z1/2 overlap) would be of some merit. Flerdle: Mathew is right. The default is Z1+2 on trains, but on buses/trams it’s “to the end of the line”. eg tram 75, if you board at Hawthorn going into the city, default fare is Z1. Board outbound, and it’s Z1/2 (eg it assumes you’re going to Vermont Sth unless you touch-off correctly). Bonnie: I wouldn’t bother buying another Metcard to use in 2011. The likelihood is that in late-2010 (or possibly earlier) the Metcard validators will get shut-off, and you’ll have to switch your ticket over. Steve: Yes. Yearly ticketholders will receive a free Myki to switch to when Myki is all running. Just go ahead and get your new Yearly Metcard. par3182: See Wednesday’s newspapers. 1700 people got the wrong letter and/or cards. Today I used metcard to travel from sunshine to the city and return – i used the 5 daily card so my cost for the day is $5.88. I intend to use my myki card tomorrow, how much will it cost:? See the Q+A. Same cost. They’re refusing to give an (03) telephone number for the 13myki call center, so no dice for overseas visitors. 9:30am touch on in the zone 1-2 overlap. 9:40am touch off in the zone 1-2 overlap. 9:50am touch on in the zone 1-2 overlap. 10:00am touch off in zone 1 proper. How will the system behave, how much will I be charged? 9:30am touch on in zone 1 proper. 10:00am touch off in the zone 1-2 overlap. Would the overall result be the same as the first scenario? One would think so, it’s an exact reversal of the first scenario, but reading the F&TM doesn’t inspire me. I saw on the Internet today that myki can only be used on metropolistaion trains and some regional busses and v line stations in the metropolitain train network. Myki will not be used on any other oublec transport until later on this year. I cant wait until metcards dont excist anymore. They are paper wasters. I catch the bus to school and use metcards. I usualy throw my metcard away when it expires. It is a waste of paper. Myki can be used and used for the rest f your life. Nick, obviously in both those scenarios you should be charged for a Z1 trip, and I think you’d be safe in scenario 2, though before I saw your comment I had been thinking I might try something along the lines of the first one. Well, my Myki card turned up today and I breathed a sigh of relief when it had the correct name on it. Yay! Then I read it was a concession card…. huh? Rang 13Myki and the first recording acknowledged the concession error in letters and assured me that my card was full fare. 2) go to the train station and use the machine there. Have you seen the way people exit trams? Do you think people will wait for the MYKI machine to respond before jumping off? Maybe the touch off machines should be at the tram stops. Nobody wants to hold up a tram. At some city stops, you have 30-40 people getting off, all touching (2 seconds each) could delay trams by a minute or 2 per stop. I don’t think it’s that well thought out on the tram and bus front. Just used Myki for the first time. For me it was FANTASTIC. Do not know what a daily is on Sundays (Full fare Zone 1) but I only paid $2.94 and the touch on / touch off’s were really fast and responsive. I feel all too oftenpeople just do not embrace change! $2.94 is the two-hour fare. The weekend/public holiday daily on Myki Money is $3.00 actually Somebody.